During the summer I love to act on a whim. So I am often heading out with little warning, either running to a friends house, out to the store or a babysitting job(though for my week day babysitting job I usually use a larger tote). As a serious planner this can sometimes be difficult for me, so I find the easiest way to keep myself sane while running from place to place is to have a super well packed bag. This way I can grab it as I run out and be prepared for wherever I may be going. So I thought it would be fun to share the essentials that I keep in my bag. I got this super affordable but adorable crossbody from Old Navy. 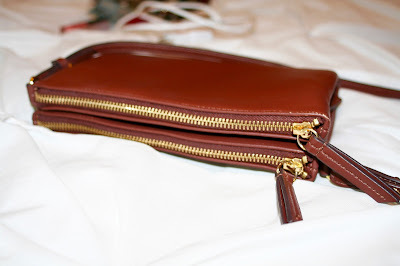 I love it, because it has two zippered pockets as well as an open pocket in the middle. I keep my wallet in one of the zippered pockets and everything else in the other zippered pocket. I love having the open pocket in the middle to stick my phone in, so I can have easy access while I am out and about. 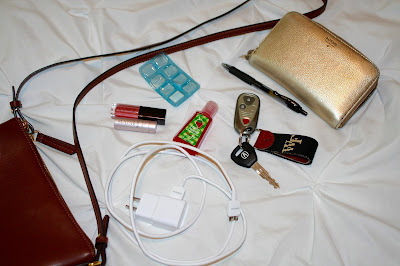 I try to keep it simple in my purse, not to overload it with to much stuff. There is nothing worse then lugging around a heavy purse all day long. I keep only the essentials for a mid day refresh or afternoon recharge. One of the biggest things I keep in my purse is my wallet. I absolutely love the color and style of this Fossil wallet. It has room for everything I could possibly need and it is all easy and accessible. I also keep my keys in my purse, obviously when I'm out I stick them in there but when I'm home too that way I always know where they are. Plus how cute is the key fob, I absolutely love the Smathers & Branson key fobs! I always keep a pen because you never know when you are going to need to write something down or when you'll have a spark of inspiration. I also have been keeping my phone charger, because my phone is old(I desperately need a new one) and the battery only lasts a couple of hours if I'm lucky. Hand sanitizer is an essential, especially as I've been babysitting because anywhere kids are is an instant breeding ground for germs. And it is no fun to be sick during the summer. Gum is another essential to help keep your breath fresh. And I always try to keep a few lip products, chapstick is essential in the summer time, but a good lip gloss can be the perfect pick me up when your makeup and energy has started to fade. I hope you enjoyed this look in to my purse! I also have babysitting and pool bags, so let me know down below if you would like to see what is in those. 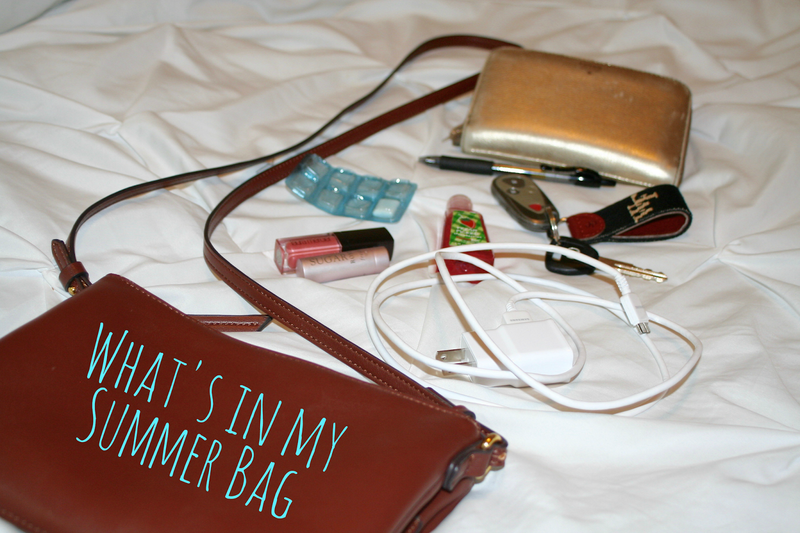 Also, tell me what your one purse essential is! Old Navy crossbody bags are the best! I love the key fob as well! They really are! Affordable but super cute! 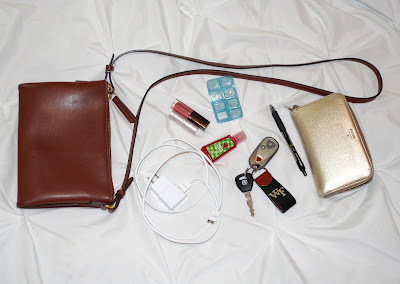 I have the same crossbody and I love it!